The Dallas – Ft. Worth area is home to an amazing variety of beautiful, hearty trees. This is, in part due to the Dallas Urban Forestry program, which envisions all of Dallas as a city of tree-lined streets. There are many types of trees to plant in Dallas that do well in our environment. Fun fact: did you know that Dallas is now home to the Trinity River Forest, the largest hardwood forest in America? If you haven’t visited, you are missing out! It hasn’t been easy. Extreme heat, storms, hurricanes, fires, the long drought, and the dreaded oak wilt disease have ravaged our landscapes. It’s only through the dedicated work of legislators, foresters, homeowners, landlords, volunteers, and tree lovers that we are coming back. A Texas tree must be as hearty (or heartier) than its people. 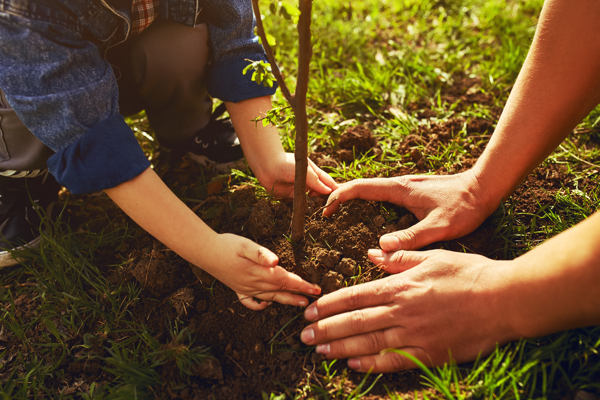 Therefore, we’ve created a list of the types of trees to plant in Dallas Ft. Worth that will last more than a lifetime. Texas Ash (Fraxinus texensis) – Ash trees get a bad rap, and some you should avoid (like Arizona or bottomland green), but the Texas Ash is perfect for the Dallas area. It grows to 45’ tall, has a long life, stunning fall colors, and grows in almost any soil conditions. Rusty Blackhaw (Viburnum Viburnum Rufidulum) – This small tree is great for landscaping; it grows in almost all soils as long as they are well-drained. It has dark green leaves and produces white flowers in the spring and blue fruit in the fall. Bald Cypress (Taxodium Mucronatum) – Montezuma Cypress is a cousin of the popular Bald Cypress. However, it is much more drought tolerant, keeps its color longer in the winter, and doesn’t develop knees that some owners find problematic. Cedar Elm (Ulmus crassifolia) – It’s the most widespread elm tree in Texas for a reason; it thrives under our extreme conditions with very little care. It is susceptible to Dutch Elm disease, although much less so than the American elm. Chinquapin Oak (Quercus muehlenbergii) – This is considered a Texas Superstar tree by Texas A&M because of its relatively fast growth and resistance to oak wilt disease. These trees will grow up to 70’ tall and 3’ wide. Anacacho orchid tree (Bauhinia lunarioides) – This lovely orchid tree is native to only a few valleys in Texas and Mexico; its resistance to extreme weather, coupled with its lovely pale pink flowers makes it an excellent landscape addition. Flowering Dogwood (Cornus florida) – Flowering dogwood prefers a moist soil underneath larger shade trees. The grow very slowly, but are extremely resilient and its flowers a welcome additon to any landscape. Desert Willow (Chilopsis linearis) – More closely related to a vine than a willow, this hearty small decorative flowering tree thrives in drought. In fact, you must be careful not to overwater them or they’ll die. Red Buckeye (Aesculus pavia) – This tree is a favorite amongst gardeners because its crimson colored flowers sprout early in the spring, lasting for several weeks. It’s also a favorite amongst hummingbirds and butterflies. Now that you know some of the preferred trees to plant in Dallas Ft. Worth, here are some trees you I think you should avoid at all costs. Cottonwood (Poplar) – This tree is actually illegal to plant in certain states and homeowners that have them can attest to the mess associated with the cotton fluff that comes from the female tree. To top it off, the trees are brittle, have a short life, and prone to insect infestations. Silver Maple (Acer saccharinum) – In Texas, this is considered a “junk tree” that has been overplanted. The Silver Maple grows quickly but if not trimmed regularly produces brittle limbs that snap off in storms. Leyland Cypress (Cupressus × leylandii) – Also known as Italian Cypress, these trees thrive in mediterranean climates. In other words – NOT here! Thanks to our long drought, we’ve killed many of them in the region. Bradford Pear (Pyrus calleryana) – The flowers may look lovely, but don’t take a whiff (it smells like rotting fish or worse). On top of that, their branches are extremely weak and their flowers cause the tree to sprout like weeds. Do not plant at all costs. On the fence: Box Elder (Acer negundo) – The box elder is a funky native tree that also has brittle branches and is hard to get rid of. However, some do enjoy their charms and suggest that their resilience is a blessing, not a curse. The box elder are crucial to local ecosystems as they provide habitat and food for many different wildlife species. This, of course, is just a brief list of some of the many types of trees to plant in Dalls Ft. Worth. If you are interested in learning more, consult your local nursery or give us a call. « How Do I Find Tree Trimming Near Me?